Target breakouts, brown spots and wrinkles in one go. This triple-action formula works to prevent blemishes, fade post-breakout marks and soothe redness. The lightly hydrating formula provides a velvety matte finish that minimises enlarged pores, while anti-ageing ingredients smooth skin’s texture and improve skin tone. Apply once or twice daily after cleansing, toning and exfoliating. Follow with a serum and/or moisturiser. For daytime, always use with a moisturiser containing a broad-spectrum sunscreen rated SPF 30 or greater. Allergic to aspirin (acetylsalicylate)? Do not use this product as it contains salicylic acid (BHA). What can I say? This stuff to me has been like magic in a bottle, after struggling with so many other brands for a year finally I found some thing that actually does what it says. My blemishes have faded and I have no more angry bumpy spots. My skin is brighter,smoother and for the first time in a very long time I was able to go out with out foundation! Literally it has changed my skin and my confidence! Ambo - This stuff is amazing! I am 35 and have struggled with my horrible skin since I was 14. I've tried everything, but found that the treatments available, even the medical stuff prescribed by a doctor, either does very little or dries my skin to such an extent that I almost prefer the acne. To be honest, I'd kind of given up. I'm now 4 days into using this and I am absolutely blown away by how quickly my skin has improved. All but 3 of my spots have completely cleared up, my skin tone has dramatically improved and I have NO FLAKEY SKIN AT ALL!!! It's amazing! I am absolutely over the moon!!! I had no idea my skin could look this good and I'm not even a week into using it!!! I can wear makeup without looking like the bride of Frankenstein for the first time in my life!!! At last!!! I'm using this in combination with the bha and a moisturiser and spf. It's not cheap but it is worth spending the money, I've never ever had results like this from any treatment I've used. That's it now, I'm never switching brands again! Paula! Don't ever stop making this!!!! This product did nothing for me, used it consistently for 6 weeks at night and have not seen any difference to my spots or marks. I react really well to BHA acid, but have not seen any difference in my skin since using this. It feels comfortable enough on my skin, but my spots did not calm down. If azelaic acid works for you, this might be the product for you. - but not for me unfortunately. Customer Care Paula's Choice: Hello Ebba, and thank you for sharing your experience with us. We're sorry to hear this didn't work as expected for you, but we are glad that you used our return policy. Can't speak of this product highly enough! Absolutely love it, it has done wonders for my skin. I'm 30 and have had rosacea for 7 years and nothing has worked anywhere near as well as this product. My red, p&p rosacean skin, with the odd hormonal breakout, is now 95% clear (there is no cure for rosacea) however just a touch of make up and my skin looks flawless! This product really does do what it says on the tin - lightens/brightens and lessens breakouts, it is also quite moisturising for my oily skin. The only thing I don't like about this product is the amount you get for your money but as long as it makes me feel like I don't need to hide my face under a paper bag I will 100% keep buying. Please never discontinue or change it PC! My skin was never in a good condition as I've been struggling with acne for many years. Although, my acne is not severe any more I am still experiencing breakouts, redness and post-spots marks so I am trying to treat my skin with a special care. I've been trying many overcounter and prescribed products in past years but I didn't find anything meeting my expectations but I have to admit that this PC product brought hope that my skin could be in a better condition. After a year of regular use of it my breakouts are under control (they still happen but less often) and my skin looks much smoother and brighter, basically healthier. Thus, I would love to recommend this product to anyone who is struggling with similar skin concerns as mine. I think this is one of the most effective products I've ever use. Definitely worth to give it a go! My only negative comment is that PC EU/UK do not offer student discounts opposite to USA branch. I love this product. I've found it has made a real difference to my skin and even at the worst parts of my cycle I've had minimal breakouts. And I've had acne for 30 years! I have used this product quite a few times in the past without that much of an issue all though it used to sting slightly it use to go away in a few minutes , however this time as soon as i put it on my face is stings and it gets worse. It also itches quite a lot which has lead to dry irritated skin, I can use the AHA 10% and Retinol and have no issues I don't use them together though , I know it is this product because without this i have no issues with my skin care , I have used this alone and still get the stinging and itchy skin which last quite awhile almost to the point it is unbearable I have wash it off also I have tried mixing with moisturiser to get it to sting less and it hasn't worked I have stopped now I don't know if there is an alternative to this resist brightening treatment doesn't do it for me. Customer Care: Thank you for your review. We are sorry to hear this product hasn't worked for you. Although this is not a common response, we do understand that each customer is uniquely different in how they will respond to products or ingredients. Please contact our customer care team for further assistance with finding an alternative product. This is a good alternative to Benzoyl Peroxide which made my very oily, Indian skin flake like crazy and made it impossible to cover blemishes. I noticed the life cycle of my cystic acne with this product is sped up. Doesn’t tingle or sting like BHA so a good alternative if you can’t tolerate the stronger acid treatments. I use the Clear line and have found it mainly a god- send for my 51 year old, still oily, blemish prone, break-out prone skin. I find that these products work well for me with a supplement benzoyl peroxide product BUT I found this Azalaic acid product from Paula's choice had no effect on my breakouts. I get a break out about once a month, mainly on my chin area, normally getting one or two annoying spots. It is at this time that benzoyl,peroxide, used as well as the pore normalising cleanser, balancing toner, high strength exfoliatior, clears my spots up overnight. I just see any benefit with this new product at all. I have a fair-medium olive skin tone and have always been highly prone to hyperpigmentation from acne. I always get a spot or two that time of the month, but not since I tried this have I had to deal with the red/brown mark it always leaves behind for days-weeks. Unlike other spot treatments it's effective but gentle. I notice a marked improvement overnight. It works really well without leaving my skin dry and irritated. Now that I'm using other PC products to keep my acne at bay, I only use this once every couple months. I hope it stays effective for a looong time. I do not know, my skin cannot take Benzoyl Peroxide - at all! (Except the La Roche-Posay Effeclar Duo, but then I see no effect). My face reacts so badly, if I use the tiniest amount my entire face get dry, flaky and itchy! So I thought this would work for me. However, I am not sure if I see any effects? I guess it is difficult to do anything with cystic acne/white heads. But sometimes, it seems to calm them down and sometimes it doesn't seem to do anything at all. It is a good product, I just see more effect by using the BHA toner and retinol products. ok so I tried this after benzoyl peroxide 2.5% being to strong for my skin and BHA by itself not working and it did help fade the scars I already have but didn't seem to prevent any new outbreaks? was hopeing this would work as benzoyl peroxide was to harsh! if anything the spots I'm getting now are not comeing to a head and are just hanging around for ages! At least with the BHA it caused me to breakout but they came and went quicker? I'v tried using both together but nothing seems to be working for my skin this also itched like crazy and made my skin very tender. I had high hopes for this product as a gentler alternative to Benzoyl peroxide. At first it seemed to be working - a fresh acne spot I used it on seemed to shrink faster than normal - but it had no effect on older spots or red marks - and after a few days of daily use according to the instructions, the skin on my neck got a itchy, sore rash where I had applied the product. It didn't seem to affect the skin on my face as much, though I did notice a bit of reddening, but it also had no effect on the acne on my face. It's a thick cream which feels odd to apply to oily, congested skin which acne sufferers often have. I've had to discontinue use. For such an expensive product I am very disappointed. I know each persons skin is different, so I don't expect every skin care product to be right for me, but my skin is usually only slightly on the sensitive side and I've never had a reaction like this from any other product. Customer Care: Thank you for your review. We are sorry to hear of your experiences. We will contact you by email to discuss other options. Morgz - Ditch the Benzoyl Peroxide and buy this now! thank me later! I have been struggling with moderate acne for the past 4 years. I have also been using harsh cleansers and benzoyl peroxide religiously during that period. Whilst there is no doubt that Benzoyl peroxide helped my skin in terms of breakouts, it seemed to be really harsh at the same time, constantly leaving my skin dehydrated, raw, red and peeling.It also seems that it has made my skin a lot oilier than it was previously. It would also bleach all of my clothes, towels and just about any fabric that it came into contact with - not so good. Anyways, I bought the PC clear daily skin-clearing treatment on a whim, and have not looked back since. Ever since the first use my skin is undeniably brighter, firmer and healthier, with a lot less redness. Breakouts, oil production and redness seem to decrease with every use, and my skin is overall very happy indeed. It seems to be just as effective on my skin as benzoyl peroxide, but with more benefits than side effects, so if you struggle with mild to moderate acne I would definitely give this a try, I promise you it will be so worth it! 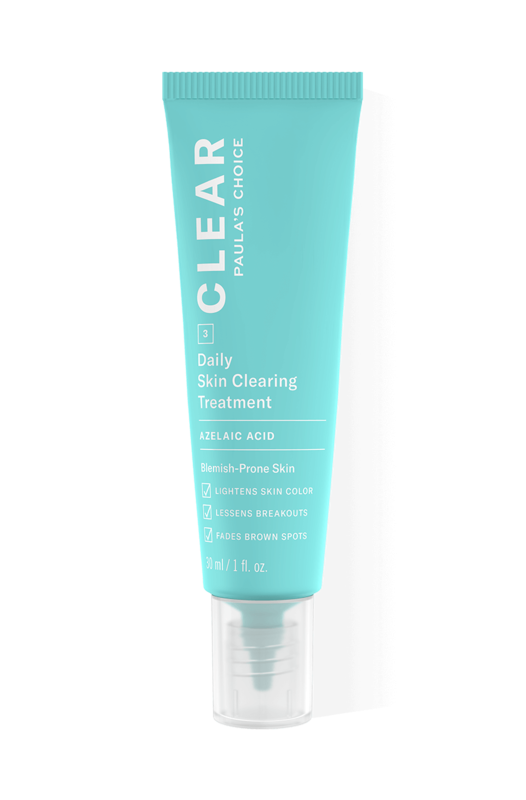 Is there another Paula's Choice product similar to the Clear Daily Clearing Treatment + dica cialezA + BHA? Our Clear Daily Clearing Treatment + dica cialezA + BHA is identical to our Resist Skin Transforming Multi-Correction Treatment + dica cialezA + BHA.